Preaching the Gospel to Ourselves? Should We Preach the Gospel to Ourselves? Recently I had a good conversation with one of our church’s pastors about the idea of preaching the gospel to ourselves. It has become a popular manta, especially in the “gospel-centered” camps. But, for those of us who upheld the importance of preaching the gospel to ourselves (and one another), have we faced a couple of questions now being raised? First, does the NT commend something along the lines of preaching the gospel to yourself? Or, is that idea (not just the language) somewhat foreign to the NT? Second, if the NT does commend something similar to this concept, why is it worth emphasizing in our day and age? And third, when it comes to sanctification, is preaching the gospel to ourselves enough, or do we move past this initial step as we move into obeying God’s commands, working out our salvation, putting off and putting on, etc.? More questions like this need to be raised so that we’re thinking about our thinking. It’s all too easy to latch onto things that feel right, like being “gospel-centered” or “preaching the gospel to ourselves,” without asking questions about its importance, its meaning, and its effects. I’ll try to tackle each of those questions briefly. Does the NT commend something similar to preaching the gospel to ourselves? The language is not explicitly in the NT. On one side, this might give caution to over-estimating an extra-biblical idea. On the other side, specific language doesn’t have to be used in the Bible in order to hold good and necessary conclusions and consequences based on that language. Extra-biblical language can be very helpful in defining what we actually mean. The best example is the Trinity. The wording isn’t used, but the idea of their being one God, three persons, and each person being fully God is clear. So, while the language of “preaching the gospel to ourselves” isn’t in the Bible, I believe the idea behind it can still be found. • Our first model of preaching the gospel to ourselves is Paul’s example. In every NT letter Paul preaches the gospel to believers. He reminds and explains the gospel to them as the basis of why they both can and should make every effort to mature in holiness. He takes them back to the historical work of Jesus (according to the Scripture) and how it is for them (the message). o Each letter begins either with an opening reminder of the gospel (Eph. 1:3-14; I Cor. 1:30) or the letter has a structure of preaching the gospel first before encouraging them to then live in light of it (See Rom. 1-8, 12-15; Eph. 1-3, 4-6). o The fact that the NT letters are so full with explicit and implicit gospel-preaching to believers must mean the gospel needs to be remembered and rehearsed so that we know what we should do (ought) and that we really can do it now (can). o Paul desires to preach the gospel to believers and churches he writes too (cf. Rom. 1:15; Phil. 3:1), not because they don’t know it already but because it must be massaged into our stubborn skulls. • Paul seems to urge Titus to exhort and rebuke the church in “these things” (3:15), which includes both the message of redemption and purification in Jesus (3:14) and the need to renounce ungodliness. See also the emphasis in 3:8 to insist on “these things, so that those who have believed in God may be careful to devote themselves to good works.” What are these things? Well it likely includes both the message of justification and renewal in Jesus (3:4-7) and the encouragements in Christ-likeness (3:1-3). • In Ephesians 4:15 Paul exhorts the church to speak the truth in love to one another as the means to mature in Christ. The truth we speak to one another (i.e., preach to one another) is primarily the gospel message about Christ’s person, work, and what we receive through him. This verse reminds us that we not only preach the gospel to ourselves as we meditate on its truth privately, but we preach the gospel to one another as we speak the truth in community. Here are two quotes drawing out what “truth” might mean here. If you agree with my conclusions above that the Bible supports the idea (or at least something close) of preaching the gospel to ourselves and one another, than the biblical justification is the best justification we have for doing so. However, I think it is especially needed in our current evangelical climate to preach the gospel regularly for at least these reasons. It’s not that this is only thing to preach to ourselves, and it’s certainly not that we only preach the gospel to ourselves, but as we move on to working out our sanctification in our daily lives we must do so with the gospel as our fundamental reason and motivation. o We need to live daily with a reminder of our sinfulness and our corrupted nature from birth so as not to become prideful or self-reliant. And yet, the knowledge of sin that brings repentance is the same knowledge that leads us to find grace, forgiveness, assurance, and help through Jesus in the gospel. We must remember both who we were/are on our own, but even more so, who we are now in Jesus. The former keeps us humble and grateful and the latter reminds us we really are forgiven, loved, and equipped. o We need this daily reminder because many see God as someone who will save them but doesn’t really like them unless they do all the right things. Many see God through the lens of how human relationships: recompense. We preach the gospel of free grace to remember God is not like us. o We need this daily reminder because we’re performance-driven and self-reliant so we will assume we can mature in holiness by our own strength and we’ll then take the credit. The gospel puts us on our knees in brokenness, but it doesn’t leave us there. It picks us up off the floor so we can by God’s grace alone press on. o We need this daily reminder because many are burnt out because all they’re told they should be doing as a Christian and they know how little progress is taking place. Our culture of busyness and accomplishment makes the Christian life feel like a fast-moving treadmill that runs them into the ground without taking them anywhere. The gospel leads to a life of risk and mission, but it doesn’t do it at the cost of our resting in Christ and relying on the Spirit to do the work through us. o We need this daily reminder because we continually sin. Our ongoing sins require us to preach the gospel to ourselves (and others in community) to remind us of repentance, faith in Christ’s work, and the promise for help as we continue to press on. The gospel only needs to be preached as often as we still struggle with sin, but since that struggle leads to daily wounds we also need to daily apply the healing salve of the gospel. o We need this daily reminder because we forget. We forget both what God has actually done for us and who we are now as a new creature in him. Our memory quite easily recalls our sin and is well tuned to hear the voices of others pointing out our failures. So, we preach the gospel of grace because its foreignness and our forgetfulness require a constant reminder of what God has said is true. This is why Paul is okay with reminders (Phil. 3:1) and repetition of the gospel even to believers (Rom. 1:15). 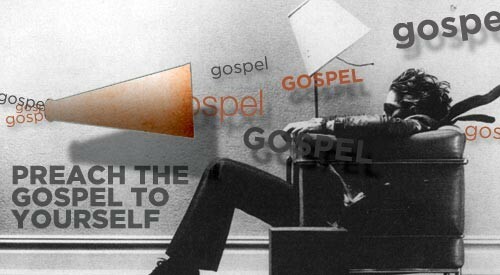 Is Preaching the Gospel to Myself All I Do? We first looked at some biblical support for preaching the gospel to ourselves and one another. Then, we looked at a few reasons why we need to regularly be preaching the gospel to ourselves. We now come to two other related questions. Is preaching the gospel to ourselves the only motivation for sanctification? And second, is sanctification only a matter of preaching the gospel to ourselves? Or, in other words, if I simply preach the gospel to myself have I done all I need to do, and if I preach the gospel to others in community have I told them all they should know in order to mature in Christ-likeness? I think the answer to these questions is no. First, the Bible includes a number of motivations for Christians to help energize their sanctification, including: gratitude, new ownership, promise of blessings and greater joy, hope of reward, assurance, duty, Jesus’ glory, fear of God, love to God and neighbor, etc. We should seek knowing more of these motivations and letting all of them increase our desires for following Jesus. One of the dangers of among some today is limiting our motivation to only our gratitude or freedom in justification. No doubt, that is a glorious truth that ignites our passion to follow Jesus, but it’s not the only one and so we should be careful to not speak as if it is. Second, preaching the gospel to ourselves is neither the end-goal or sufficient when it comes to our sanctification. The gospel in the NT is preaching to unbelievers to bring them to saving faith Christ (generally speaking), while in the NT it’s most often preached to believers with the end-goal of them growing in Christ and loving him more. The gospel is our treasure and through Christ alone we’re justified, but the gospel is meant to lead Christians into holiness and mission. We should hold strongly to preaching the gospel to ourselves, but we also must not minimize or neglect the many imperatives in Scripture and the life we are called to live in Jesus. This life of sanctification is itself grace, both because we can finally do it through the power of the Holy Spirit and because we can do it as grateful sons and daughters of God rather than slaves trying to earn their keep. As we take further steps in maturing we aren’t moving past the gospel in the sense of letting it go, but we’re moving on in the sense that the gospel pushes us into something else. The gospel we preach to ourselves is the catalytic gospel propelling us into obedient and fruitful lives. The growing trend of fearing the imperatives in Scriptures, wrongly equating rules with legalism, and stopping at preaching the gospel to ourselves is a serious error that conveys a half-truth about grace and life in Christ. Preaching the gospel to ourselves comes up short if it only reminds us of our justification in Christ without also nudging us towards the grace of progressive sanctification by the Spirit. The gospel not only holds out the promise of no condemnation but it promises us that God will write the law on our hearts, change our hearts, and leads us by His Spirit into a new way of living. We must preach the gospel to ourselves, including the realities of who we are and what we’ve received in Jesus Christ as well as the life of following Jesus we’re called to walk and his provisions for us walking it. The NT repeatedly tells us what we should do (imperative/ought) but always roots it in why we can do it (indicative/can). We must continually preach the gospel to ourselves so we do strive to grow but do so in light of God’s gracious working and power enabling us. This means we also should not shy away from emphasizing how we should live in Christ and the need for obedience and holiness. Grace properly understood gives the type of internal rest that energizes us to get to work. Clinton E. Arnold, Ephesians ECNT (Grand Rapids: Zondervan, 2010), 269. Peter T. O’Brien, The Letter to the Ephesians (Grand Rapids: Eerdmans, 1999), 311. Posted on 03/07/2014 03/07/2014 Categories GospelLeave a comment on Preaching the Gospel to Ourselves?